Cборник текстов и упражнений по русскому языку "Пятнадцать"! 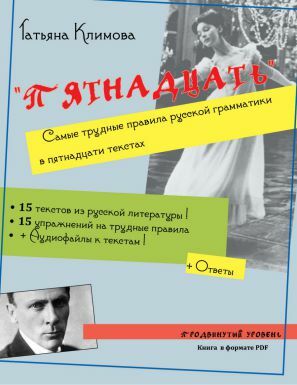 I’m very happy to offer you Piatnadsat, my compilation of Russian literature texts and exercises! This PDF book is ideal for those who already speak or understand Russian and want to improve their vocabulary by Russian classics reading. You can check a text sample here and decide if the level of difficulty suits you. How to buy this pdf-book? After the payment is completed, you will receive an email with your login and password. If you have already purchased another product, your login and password will remain the same. Connect into My Account and choose Piatnadsat button. Download the PDF-book and the audio files. Even if you will be able to access the book for ever, I recommend you download all the files straight away, in case if you forget or lose your password. If you lost your password, go to My Account and fill in your login. The password will be sent to your email. If your payment was successful but you haven’t received the email, please check your SPAM folder. The book is in PDF format only, if you don’t have a PDF reader, please download one. The audio files are in mp3 format (ZIP archive). ATTENTION ! All intellectual property belonging to the author is protected by copyright, any unauthorized duplicates or retail will entail criminal prosecution. Thank you in advance and keep learning Russian!